Happy new year......another year gone already ! 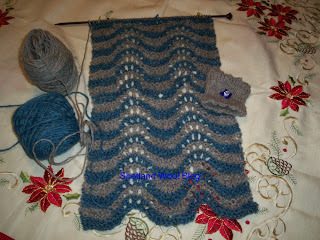 This months giveaway is for the yarn and beads to knit the scarf shown above. Easy feather and fan pattern, old shale stitch, Victorian lace stitch however you like to call it it is so lovely and this scarf has a beaded slide closure so the scarf can be knit shorter as there is no need to wrap it around your neck. Slip both ends of scarf into the tube and slide up to neck. The yarn is a natural grey and from the softest grey fleece that i purchased on the internet.....its not very soft but i dont know what soft is anymore as i always have my hands in qiviut fiber and once you touch that nothing else can compare softness wise. I rubbed it against my neck and as far as sheep wool goes its not too scratchy ! it would have been much nicer if i had blended the batch with either qiviut or Angora but its too late now ! The winter is on full blast here....4 feet of snow over the past 2 weeks. Have not seen it this bad for 12 years, its dark and miserable. And now the little Shetlands dont want to go out. I open the door, offer them to go out and they just stand there looking shell shocked (i bought these sheep from Southern Ontario and the weather there is much more pleasant than here) so now we have decided to CLIP THEM ALL......i can hear Gasp of horror......its winter is she mad ! We alre Lucky enough to have a heated barn. The barn is 160 feet long X 40 feet wide so i have a heated section for the rabbits and a seperate section for the sheep. I will move the sheep into the heated section, leave them to settle for a few days then we can start clipping them sometime in january. Been checking the fleece and its 4.5'' inches long and has crimp throughout so i can't wait to get my hands on that gorgeous stuff ! Some fleece will be blended with Angora rabbit, some with pure qiviut/musk ox fiber, some with silk....with 12 gorgeous sheepies the possibilities are endles. Once the clipping and spinning is finished in February/March i will hold a competition/giveaway for an original vintage shetland shawl knitting kit. Will most likely add a tutorial post about fleece prep too ! As you can see the scarf is not finished. Not sure how much yarn will be required but i'm thinking about 150 TO 200 grams. With US size 8 - 5mm cast on 44 sts. Please note the 1st and last 3 sts form the edge of scarf and should be knit on every row, work betwean markers. Every 4 rows change colour. Row 1:(rs) ((with slate blue)) knit. Row 3: k1, *(k2tog) 3times, (yo, k1) 6 times, (k2tog) 3 times, k to last st k1. rep from * to end. next row change colour and rep 4 rows above. work until scarf measures 55'' inches long 'ish'. cast off on the (WS) on row 4, then knit beaded slide. with US size 2 - 3.00mm d.p.n's cast on 30 sts. Join to work in rnd. Rnd 7 :* k1, yo, k2tog, rep from * to beg. 8 - 24 knit for 24 rnds. Rnd 25: as rnd 7. Rnd 26 - 32-knit then cast/bind off all sts leaving a long enough tail to sew picot edge to inside of work. repeat for cast on edge. Beads: sew largest bead to centre then sew on clusters of 3 beads around the centre bead. 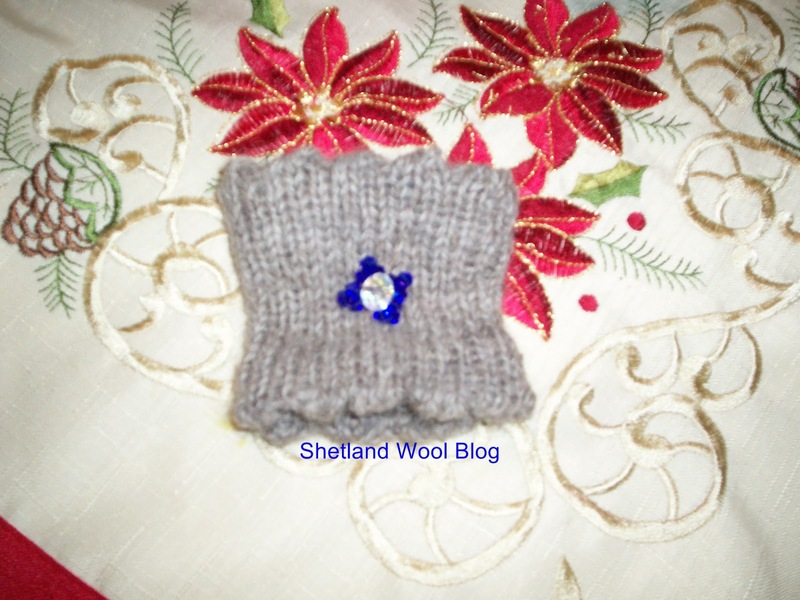 Question: How many whole main colours of shetland sheep are there ? One winner will be drawn at random from correct answer. to enter add your answer to comment section below. Best of Luck and happy 2013 ! Winner from December 2012 Competition is : FLOSSY & DOSSY.....pls contact us with your details so we can mail out your yarns ! 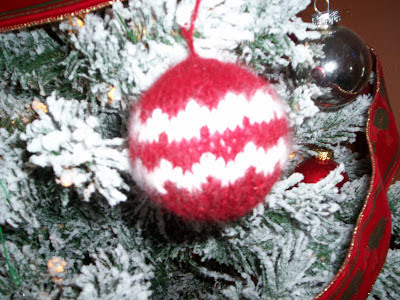 RANDOM.....this is what I love knitting at the moment.....Swedish Christmas Baubles. knit from White Angora rabbit yarn and red shetland wool hand dyed. Could be a future post sometime in 2013 ! Yes it makes for happy animals to have the barn at a constant 55 degrees ! Happy new year to you and yours. Thank you for the fun giveaway! 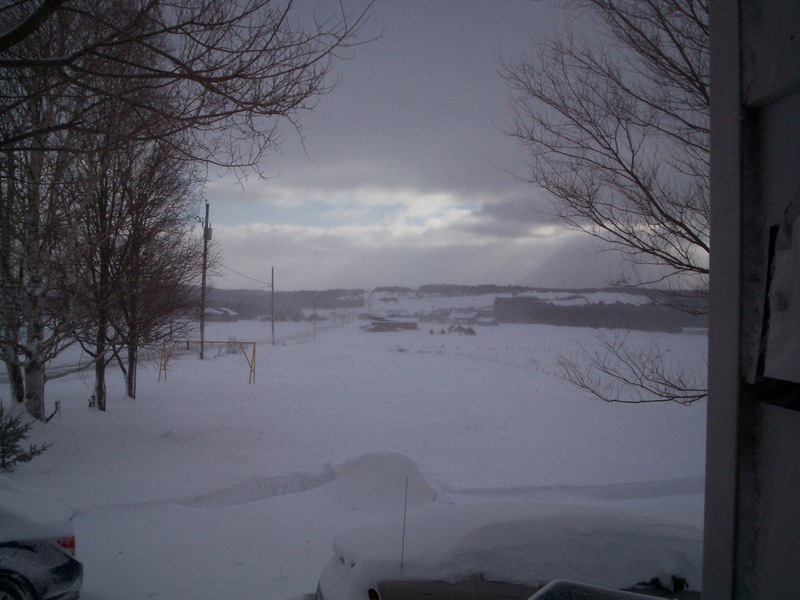 Loved looking at the photo of the view out of your window, it's been snowing here as well. And as for the Shetland sheep, there are eleven main colours. I am new to knitting and I really appreciate reading your blog as it gives me encouragement. the Shetland Sheep Society says there are 11 main whole colours, with lots of variations as well. What a lovely scarf - Old Shale has been a favourite for a long time. Happy New Year! There are 11 main colors officially recognized. 11 main colours. I love Feather and Fan. It's so mindless but yields a beautiful result. Hello, you are a winner for the shetland scarf yarn....pls contact me so i can mail out your yarns...thanks ! Apparently 11 main colours, with variations! I'm surprised there are so many, I guess I have a lot to learn about these sheep and their wool. That Christmas decoration is so cute! !